(NaturalNews) Throughout the history of collapsed civilizations, nearly all of them experienced a phase of rapid morality decline that preceded their ultimate implosion. The Nazi regime promoted the "science" of genetically-selected eugenics and mass death to "cleanse" the human race, for example, and then went on to commit heinous crimes against humanity, many of which were carried out by chemical companies that later became today's best-known pharmaceutical giants such as Bayer. To any intelligent observer, the American empire today is also in the late stages of the decline of morality. America's Commander in Chief is an accomplished, masterful liar. America's financial system is run by thieves and crooks who call themselves "central bankers." America's Congress, with a few notable exceptions such as Rand Paul, is comprised of the hopelessly corrupt who desire power for themselves rather than defending the rights and freedoms of those they claim to represent. But nowhere is the decline of morality more apparent and grotesque than in the realm of medicine, where the lives of children are systematically destroyed in the name of "evidence-based medicine" that's actually little more than a cartel of for-profit corporations seeking profit through the exploitation of human disease and suffering. Killing your newborn child is a "choice"
Consider these irrefutable facts: It is not merely legal but actually a celebrated "right" in America today to terminate the life of an unborn child. 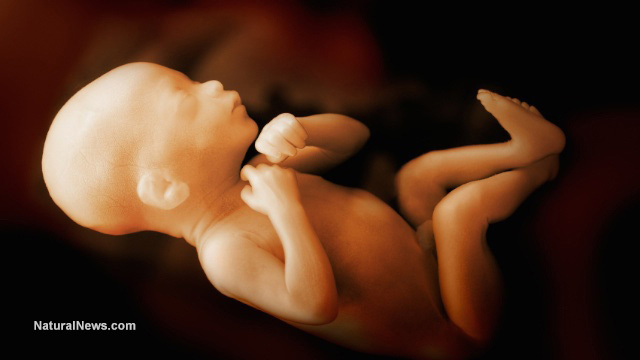 Many abortion advocates not only promote third-trimester abortions where the child is indisputably alive, awake and conscious; they also promote post-birth abortions where parents are encouraged to have their children killed up to the age of three. An article published in the Journal of Medical Ethics, for example, argued that parents should be able to murder their children after they are born because it is merely a post-birth abortion. The scientific authors literally argued that "after-birth abortion (killing a newborn) should be permissible in all the cases where abortion is, including cases where the newborn is not disabled." The twisted logic of such thinking is centered around the bizarre claim that infants are not "conscious" until the age of three, and therefore killing them is not really terminating a life. Some of these post-birth abortion advocates insist that parents who give birth to a child and then realize they really didn't want the child have the moral right to end that child's life as a "medical choice." Parents who disagree with a doctor's recommendation and seek a second medical opinion are increasingly subjected to medical kidnapping -- a terror-style tactic now used by the medical establishment to take children away from parents so that those children can be subjected to medical treatments that generate repeat profits from Medicare payments. As Natural News has now documented in this article, medical kidnapping is on the rise in America as hospitals desperately seek new avenues from profiting through the exploitation of a the life of a child. The upshot of this situation is a medical system where morality has been turned so upside down that killing your child is a "choice" while protecting your child is a "crime." Why isn't the FBI investigating medical kidnapping? I am a passionate defender of life and medical freedom, which means I openly condemn the wildly unethical and immoral actions of hospitals and government "authorities" who plan and carry out the medical kidnappings of children. In a society grounded in law -- which I wholly support -- such actions would be felony crimes investigated by the FBI. But it turns out the FBI is far too busy thwarting crimes plotted by the FBI in the firs.... This is the new role of federal law enforcement in America: to engage in the necessary theater of "stopping contrived terrorism" to convince the masses that they are halting crimes, all while real medical terrorism is taking place right under their noses in hospitals across America. When medical doctors conspire with state authorities to kidnap children, they now do so with total impunity. This appears to be founded in an imagined right of government to commit "child forfeiture" -- an extension of modern law enforcement's so-called "civil asset forfeiture" where police simply ransack citizens' vehicles and homes, confiscating their cash and property for no justifiable reason whatsoever. "Child forfeiture" stems from the belief of America's modern-day government tyrants that children are the property of the State and that parents have no rights or privileges other than those granted to them by the state. Yes, a parent has the "right" to make sure their child is injected with a viral cocktail laced with brain-damaging mercury and other toxic vaccine ingredients, but that same parent has no right whatsoever to say "NO!" to that treatment for their own child. The progressive-minded liberals in government who claim to be "pro choice" are, of course, rabid anti-choice proponents when a parent's choice deviates from the aims of government. A parent who chooses to home school their children is condemned. A parent who chooses to avoid vaccines and instead raise their children around farm animals and healthy soils -- Mother Nature's vaccines -- is subjected to medical kidnapping and law enforcement searches of the.... A parent who rejects toxic fast food and seeks to teach their child how to grow organic vegetables in their own front yard is threatened with jail time and government ridicule. But a parent who declares, "I want to terminate the life of an eight-month-old baby I'm carrying in my body" is joyously celebrated by the establishment media and Obamacare-funded medical institutions. These things are not part of a healthy society. They are, in fact, signs of a society that worships death, disease and greed while placing an astonishingly high priority on the continued medical abuse, chemical abuse and sexual abuse of children. We are all witnessing the last desperate gasp of a society on the verge of not just moral implosion but economic disaster -- a natural extension of the abandonment of morality. This is an era where "science" is dominated by poisoners who advocate chemicals in the food supply; where government is dominated by child predators; where medicine is dominated by child abusers; and where the institution of organized collegiate sports is very often dominated by child molesters. Not surprisingly, the most condemned individuals in this twisted society are those who value the lives of children and who seek to nourish, educate and protect them. Midwives are under constant attack for this very reason, even though midwives tend to be some of the most compassionate and caring individuals on the planet. Homeopathic medicine, which is ideal for children because it is very mild in its effects and has no toxic side effects, is routinely condemned in favor of chemical psychiatric drugs that quite literally shrink childrens' brains. People like myself who teach nutrition and who award nutrition grants to schools that teach children how to grow f... are of course routinely threatened by sociopathic chemical pushers funded by pharma and biotech -- people like Forbes.com writer Jon Entine, who violently attacked his wife and traumatized his own daughter according to an exhaustive collective of court documents unveiled here on Natural News. So if you happen to be a person who is being reported to the police by a profit-seeking doctor, that's probably a reliable sign that you are a remarkably responsible parent looking out for the best interests of your child. You may also believe that you are your child's parent and that the State does not own your child, which is exactly why you will be subjected to North Korea-style threats and coercion attempts by your local government bureaucrats who have convinced themselves they know how to raise your children better than you do. As I've stated many times before, the greatest threat to the medical system today is a person who can think for themselves. Any thinking person would naturally be skeptical of the psychiatric drugging of children or the forced chemotherapy of a teenager who's already near death. Any rational person would question the injection of children with mercury and formaldehyde. Any person with even an iota of common sense remaining would seek a second medical opinion for any serious diagnosis of illness in a child. Yet all these actions -- being a medical skeptic, questioning mind-altering drugs and seeking a second medical opinion -- are now enough to have you detained at gunpoint while the local hospital seizes your children and forces them to undergo toxic treatments against your will. What all this announces to the world is that the very system of modern medicine dominating western culture today is a morally bankrupt, scientifically inept institution of coercion by force. Any system of medicine that must resort to coercion and forced treatments which violate parental rights is no system of medicine at all. It is a medical regime; a "scientific dictatorship" whose real tactics are grounded in intimidation and social engineering rather than scientific evidence and transparency. In effect, modern medicine is now based more on fear than science. The whole point of seizing children, intimidating parents and having state officials kidnap children under the guise of "medical care" is to send a message of fear and terror to all the other parents in the hope that they will obediently comply with the medical directives of the regime. In effect, the state-sponsored medical kidnapping of children runs parallel to the threats by the IRS to seize your property, or the threats of the FTC to seize your small business. The common tactic of state-sponsored fear is to threaten to take away what you love or value if you do not comply with the demands of the State. Those things might be your bank accounts, your house, your business assets or even your children. And if you still do not comply, they will take away your freedom by imprisoning you in the corporate-run prison system that has now become the new de facto slavery infrastructure in America. As you ponder all this, make no mistake that when you take a child to a medical doctor, you are in essence surrendering "ownership" of your child to the State. Should that doctor recommend a diagnosis or treatment you do not condone, it's already too late to stop that doctor from forcing such treatments onto your child, even absent a second opinion. Keep in mind that cancer doctors routinely invent false positives for the purpose of profiting from ..., so taking your child to a conventional cancer doctor (oncologist) who is unethical may result in that doctor fabricating a positive cancer diagnosis for your child, then threatening to call CPS if you do not agree to have your child poisoned by that doctor for their own financial gain. This is precisely why you must be especially cautious of the doctor you choose to allow your child to see, and this is even more important to keep in mind before ever taking a child to see a cancer doctor you don't even know. That cancer doctor may, in fact, be on the verge of a personal bankruptcy and might need the cash influx provided by the chemotherapy treatment of your child. Modern medicine, after all, is primarily driven by profit, not humanitarian intent. And that is precisely why it is now based on coercion rather than free choice.